The Walking Dead offered us a slow, quiet chapter as the penultimate episode for Rick Grimes, setting the latter up for some suffering at the end. This installment was essentially two serious conversations, the first was a long overdue heart-to-heart between Rick and Daryl and a baffling dialogue between Michonne and Negan. Hearing that Maggie was heading to Alexandria and knowing what purpose she would have by going there, Rick tries to follow her, only to be stuck in a hole with Daryl where both are forced to finally voice out their misgivings about the other’s decisions. It’s a cathartic conversation albeit slightly contrived (but it’s The Walking Dead so that much is expected) and we also finally get to hear more from Daryl other than grunts and one-liners. His grievances are valid, and he manages to make Rick see some sense, to see how his tribute to Carl by keeping Negan alive was an affront to all those who Negan had victimized. And Rick also realizes this much, even as he tearfully tries to hold on to that naïve vision of the world he wanted for Carl. Daryl also reinforces the fact that no one wants to betray Rick, not after all they had endured together, but they still need him to change. This was easily the best part of the episode and a painful setup for what we all know will be Rick’s final moments on the show. There was a brief kerfuffle in the camp when the belligerent saviors confronted Carol and tried to fight back against the system, further proof that Rick’s idealistic setup was never going to last long. Daryl and Rick scramble up from the hole, despite a horde of walkers (of course), and somehow part ways. This leads to the very contrived and frustrating cliffhanger ending of the episode but more on that later. We also have some quick scenes with Jadis and Gabriel continuing their strange little love affair, with the former being convinced not to murder the latter with a walker, and then leaving him alone in the dump. Gabriel’s ability to survive in The Walking Dead for so long is one great mystery. Michonne’s talk with Negan was a little more intriguing. It was fascinating to watch these two interact as Negan himself points out that he mostly spoke to Rick. He tries to push Michonne’s buttons by mocking the quiet life she currently leads and reminding her of the badass warrior that she is. And for a while, this strategy seems to work as she gets visions of fighting with Lucille and as she repeatedly glances at her katana. But in the end, she doesn’t fall for Negan’s tricks and she figures out that he just wants a chance to see “her” again which Michonne assumes to be Lucille the bat but which we aren’t exactly sure about. If Negan continues to live, we need to see more of him than just a figure in the shadows, though. 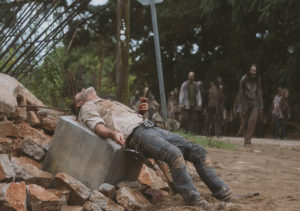 The episode concludes with Rick trying to lead a horde away from the bridge and then falling off his horse just at a place where he also gets impaled on a rebar while two hordes are converging. 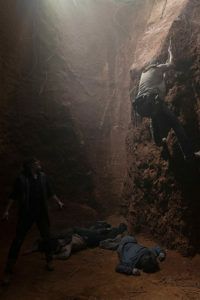 As IGN has noted, this is a bit of a cheap shot as no one really believes that this is how Rick Grimes is going to die. Even if next week is his final appearance on the show, there has got to be a more appropriate send-off for one of the show’s main players. So, now we’ll have to wait and see.